I don’t care if I have tears and snot streaming down my face, Dad. 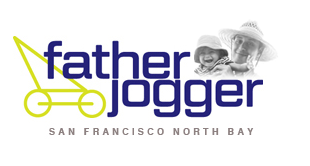 I want to be very clear to you: I’m not getting into that jogging stroller, that rolling prison with oversized wheels. Period. Not with this beautiful weather and bright sun, and with the birds singing in the trees. 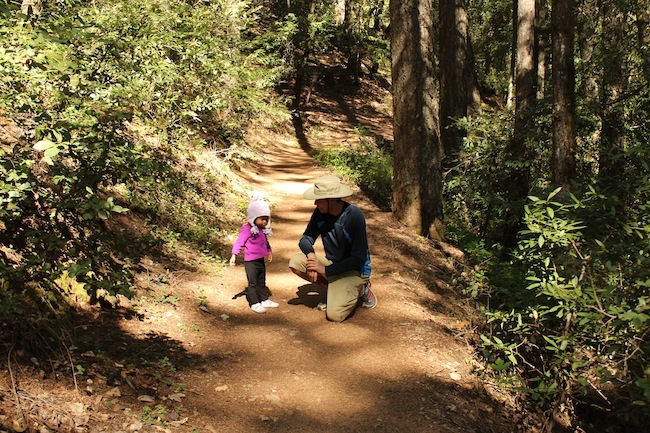 Forget my snack, forget my stroller, let’s hit the trail – by foot, like how you big people do it – already! 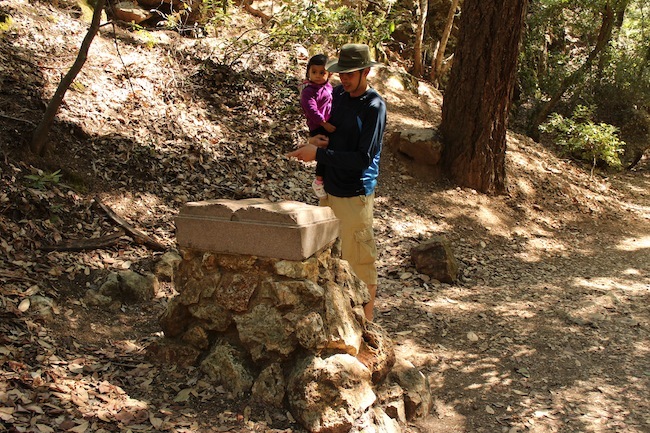 The Robert Louis Stevenson Memorial Trail is a ten-mile round trip trek to the top of Mount Saint Helena, and one of our favorite hikes. 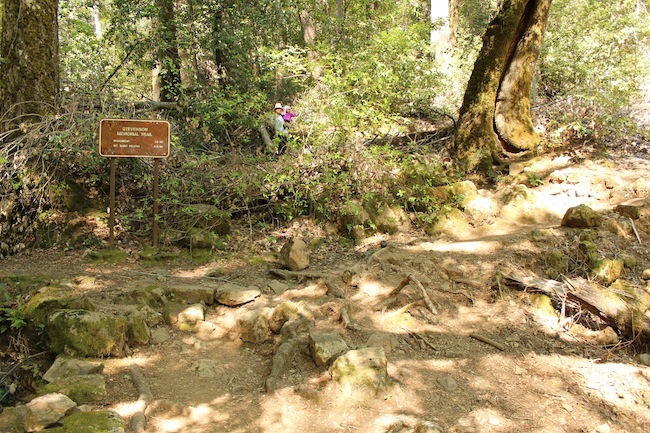 In our pre-Bpoo, pre-London days, Mummy and I would hike this trail several times a year, through heavy rain or sleet, thick fog, or blazing sun. On a clear day, the view from the peak is unbelievable – an amazing 360-degree panorama of hills and mountains, 4000+ feet above sea level – making the moderately difficult, monotonous hike to the top worth the sweat and eventual body aches. …but, upon arrival, discovered Bpoo was just as excited as we were, and had no interest whatsoever at the idea of being strapped in a stroller for her adventure! She started to cry at the mere sight of it, which was very odd, considering she’d usually climb right in for our regular morning jogs. My attempts at physically placing her into the stroller were met with back-arching and wails of protest, so Mummy and I gave up. I pushed the empty stroller with Mummy and the now-smiling Bpoo over to the picnic tables near the trailhead for Bpoo’s quick snack. Bpoo protested again; she just wasn’t in the mood for either her yogurt or wasting more time. “Ah, forget it. Let’s just go,” I mumbled. 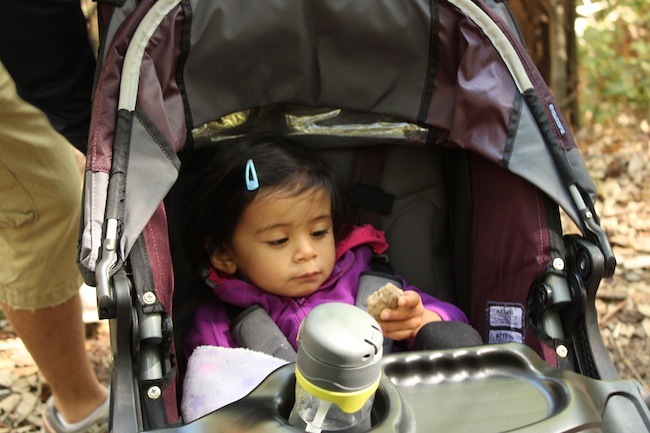 About 10 minutes into the slooooowwwww hike – Bpoo stopped to admire nearly every stone, plant, or tree along the way – Mummy and I decided to force her into the stroller to complete the out-and-back before her lunchtime. Sensing this, Bpoo’s smiles disappeared, and the back-arching and crying resumed again as we struggled to strait-jacket her into the stroller. 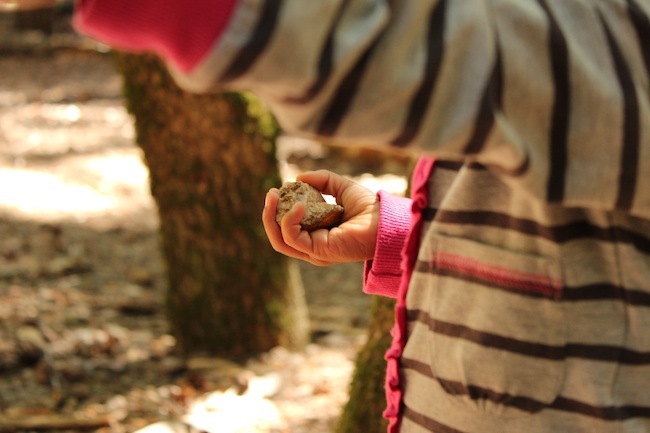 I grabbed a few stones off the trail and handed them to Bpoo to calm her down, and she happily inspected them as we resumed our hike. 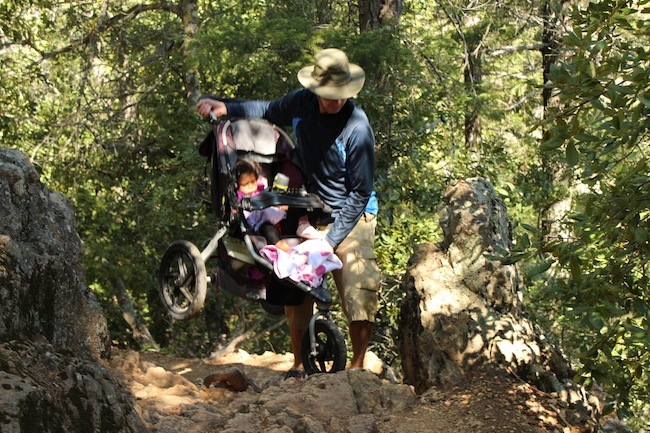 With the stroller (and Bpoo inside it), the rocky surfaces and exposed tree roots on parts of the trail made the hike a bit more challenging, forcing me at times to cleverly maneuver the stroller or carry it outright over the difficult surfaces. Despite the minor struggles, we made it to the monument, a granite structure commemorating the site of Stevenson’s honeymoon cabin. 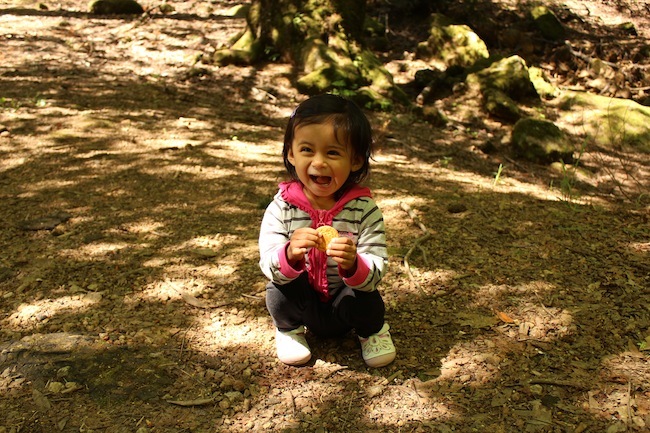 We released Bpoo from her stroller, and she cheerfully began her exploration of the area, picking at more stones, slapping tree trunks, and stomping on the brush. I gave her a rudimentary geology lesson based on the Mt St Helena Wikipedia article, and she happily took it all in…I think. Before starting on the return trip to the parking area, Bpoo complied with our request for her to ride in the stroller once again, and the remainder of the hike went smoothly. We were getting very hungry, and looking forward to lunch at Buster’s, in Calistoga, the best place for a tri-tip sandwich we’ve ever been to. Overall, a great day for the family! 1. The trail to the monument is NOT suitable for jogging strollers. 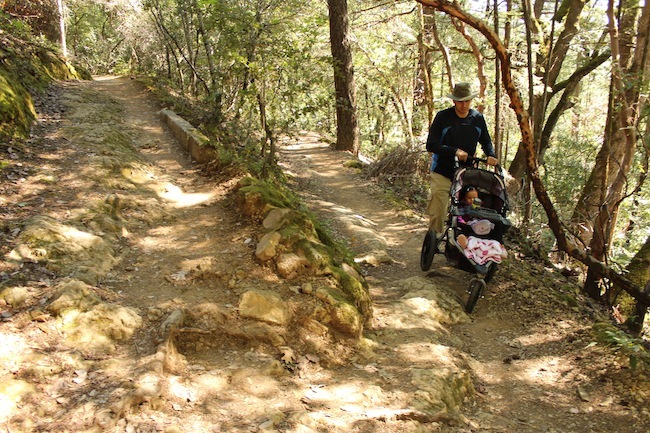 I haven’t tried the stroller out on the fire road leading to the peak yet. 2. Come early; the parking area has few spaces. 3. It’s very easy to miss the trailhead/parking area. I programmed coordinates found on Wikipedia into my GPS unit, and thankfully it led me right to the parking area. 4. 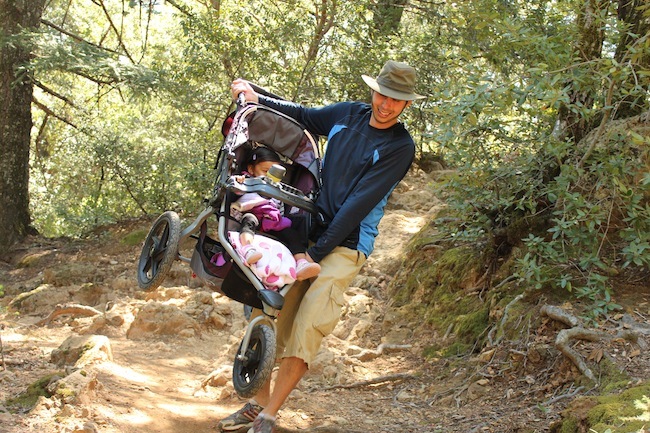 On the drive to the trailhead, your child may experience sensitivity to the elevation change. Mummy and Bpoo at the trailhead. This sedimentary rock calmed Bpoo down, allowing us to resume our hike! 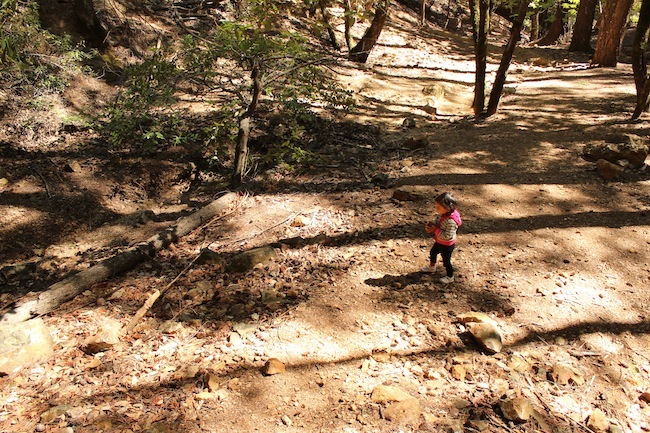 Exploring the site of where Stevenson’s cabin used to be. Kenilworth Castle, UK: Bethypoo’s First Road Trip! Thanks! I definitely think a good way to stay sane as a SAHD is to get out with the little one.